One issue, the one that’s important to Willighagen, is whether a work can be revised, remixed, and reused. This was part of what I was aiming for with forall x, and at least ten academics have revised it or taken parts of it to use for their own custom books. This is what Peter Suber calls Libre OA. So the distinctions that matter to me for academic articles are within kinds of Gratis OA. Here there are two standard labels: Gold OA involves the final, published version of the paper being freely available from the journal or publisher itself. Green OA involves a copy of the article, probably the word processor version rather than the typeset final version, made available by the author either from their own website or from a repository. Gold OA itself comes in two important varieties, depending on whether or not the author has to pay the journal to publish. 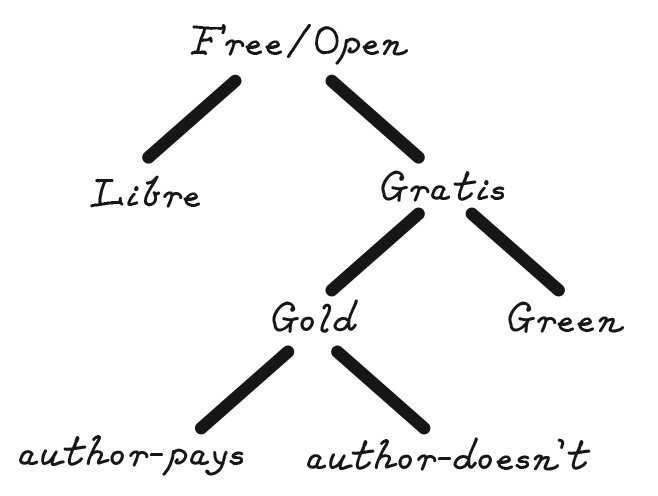 Author-pays Gold OA is still Gratis because the reader doesn’t pay anything, but the model invites for predatory journals to publish anyone who pays and for commercial publishers to extract money from both ends by offering an OA option at pay-journals. UPDATE 22sep: Over at Daily Nous, Roberta Millstein weighs OA options and uses “gold” narrowly to refer to OA where authors pay but readers don’t. She uses “diamond” or “platinum” to refer to OA where authors don’t pay. But she says in the comments that she hates the terms and tries to avoid them. Facebook being Facebook, that link might or might not take you there. The analogy breaks down if you imagine baking beer bread with it. And it could use a better name. The fact that I can get an article through my library doesn’t change this. Filling out the Interlibrary Loan request form is kind of a pain. I will do it for something that’s clearly relevant, but maybe I won’t for something that seems peripheral. And some scholars don’t have the same library options that I’ve got. A propos verdegris, Copper OA can weather into Green OA. As I think I mentioned in the linked but friends-only thread, “Author-doesn’t-pay Gold OA” is sometimes called Diamond or Platinum OA. So those might be better names. Matt: The problem with Diamond OA or Platinum OA as names for the author-doesn’t-pay variety of Gold OA is that diamonds and platinum aren’t varieties of gold. The metaphorical names come with some constraints if they’re to make any sense. That post makes the objections to Plan S clearer to me. I’m not convinced that requiring Libre licensing as a condition of funding violates academic freedom, but I see how it would be more contentious. Regardless, though, funder mandates are mostly irrelevant to philosophy because most of our research isn’t grant funded. On reflection, I’m tempted to call the two varieties Fool’s Gold OA (author pays) and Pure Gold OA (author doesn’t pay).